As I have become increasingly aware of how easy it is to reduce, reuse and recycle and how great it is for my own health and that of the planet...I've decided to post some crafts and projects on this website that I've either been making or would like to make someday. Some of these make great gifts as well. I would love to include stories, pictures and how-to's from any of your ideas or projects as well...feel free to contact me. Here is an example that I found on the internet. Basically you need a bunch of newborn diapers (if the mom is using them - I love cloth diapers because they reduce so much waste! However, it is nice to have some disposable ones for when they are on the go). You roll each diaper separately and arrange them in a circle tied with a ribbon for each layer of the "cake". 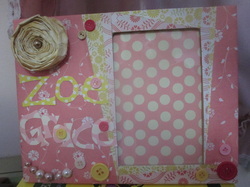 You an add different items for decoration or gifts if you'd like as in the picture to the left. There are many examples available on the internet so just look for ideas. This makes both a party decoration and a gift all in one. 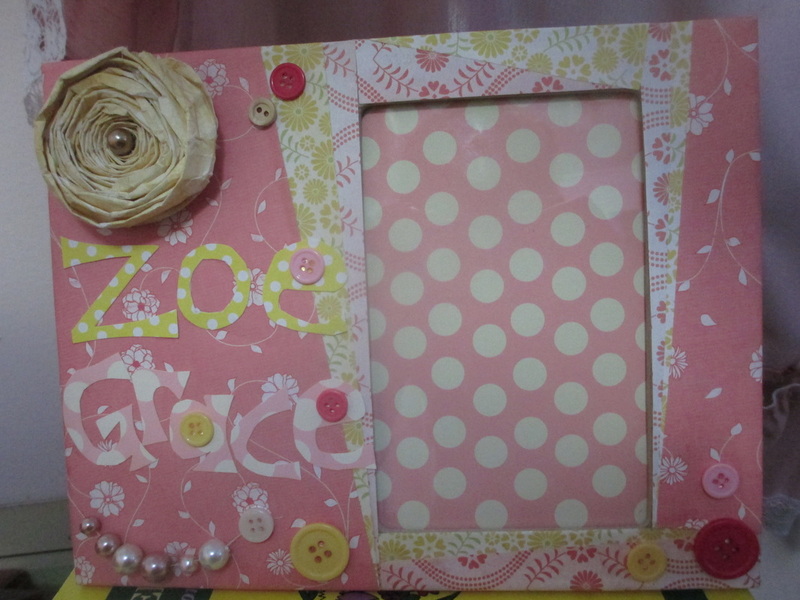 I have recently been making collaged frames as baby gifts. See photos below. 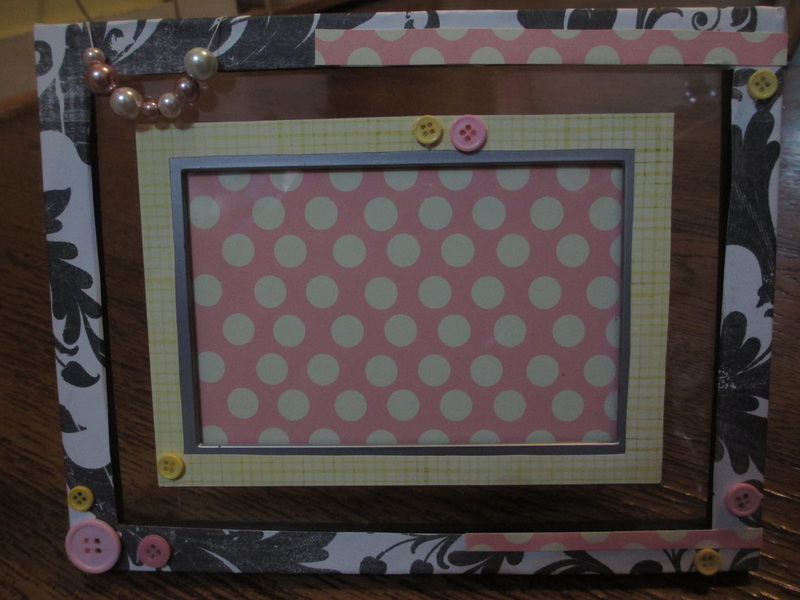 I bought a used frame (maybe you can find one at home) and used colorful scrapbook paper to collage the frame, gluing on the pieces of paper with Mod Podge. Then I added some decorations using a hot glue gun; cut out letters of her name, a paper flower, string of fake pearls and buttons. You can finish it with a smooth layer of Mod Podge on the surface for a bit of gloss but I preferred the matte finish of the paper. Recently I created this button-closure felted wool computer case, as the last one I'd purchased broke two weeks after bringing it home. 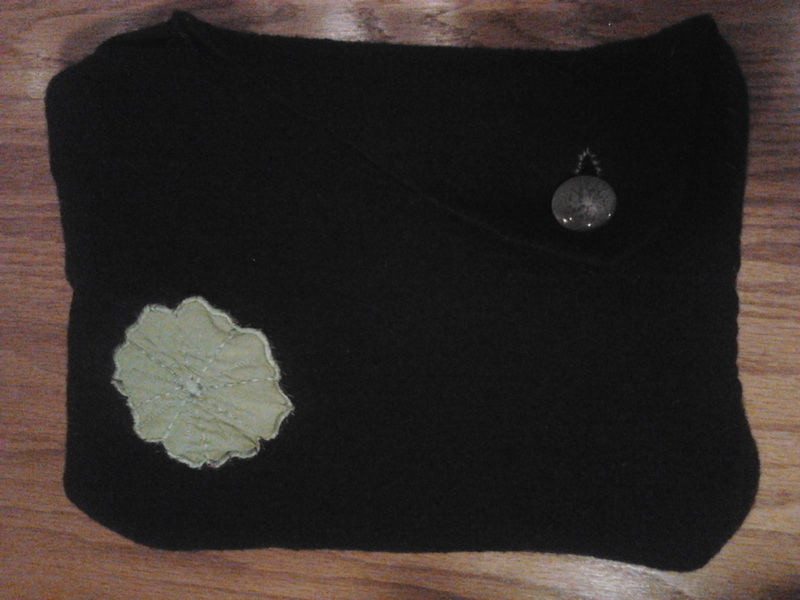 It was fun and made completely from reclaimed materials (my wool sweater, a flower patch cut from a T-shirt, a button and thread). The following is an excerpt from “The Sweater Chop Shop” book, where recycled wool knitwear becomes the gateway to everything from a beautiful blanket or throw pillow to a holiday wreath or a child’s stuffed toy. try patching pieces together to make colorful tops, such as the ones shown in the Image Gallery. home washing machine and dryer. Here are a few tips for successful felting. weight of jeans and towels agitates the wool and enhances the felting process. felt that lacks body become full of it! repeating the process one or twice more. wool has shrunk too much and too densely. After an item has crossed that line, there’s nothing you can do. top of the pile, right side up. short ends together. Insert 1 1/2 inches of the two short ends in one corner between stacked layers. 4. Pin all four corners in place, being certain that you have “caught” both ends of the hanging loop. in place. It also allows pin removal in this corner, making it easier to hold and work on the next steps. 9. Iron the finished pot holder with lots of steam to make a nice, flat finish. through your old clothes, tablecloths or other items no longer being used — or at the thrift shop. melting with prolonged heat exposure. Just look for a pattern or palette you like. holder project, beginning with Step 2, above. Reprinted with permission from The Sweater Chop Shop, published by Storey Publishing, 2009.